A Tahiti cruise is the very best way to appreciate the largest and most densely populated of the Polynesian islands. For the latest deals with Cruise 1st Australia click here. Why choose a Tahiti cruise? It has been said that the beauty of Tahiti is unmatched – and when you take in the crystal clear blue waters, lush green scenery and picture perfect powder white beaches trimmed with palm trees, you will see why. The figure-of-eight shaped island of Tahiti was formed when two volcanoes erupted and formed the impressive landscape you can see today. The largest part of the figure-of-eight shape is Tahiti Nui (meaning “big”), and the smaller part is Tahiti Iti (meaning “small”). Although the two halves of the island are joined by a small strip of land, from the air they appear to be two separate islands. 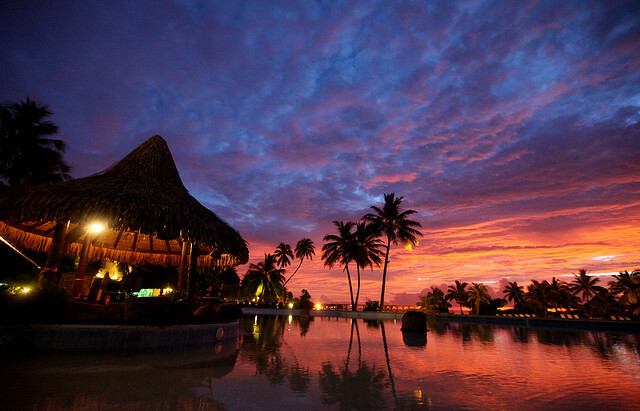 Tahiti today is the urban hub of the Polynesian islands with the port of Papeete at its centre in Tahiti Nui. You will hear a unique mix of French and local languages as you take in the bustling main boulevard with its sidewalk cafes and the colourful municipal market, as well as chic shops selling French wines, fabric, crafts and jewellery. Tahiti Iti is far more rural and sparsely populated with just a few small villages and beaches. It is well worth taking a day trip along the quiet coastal roads of Tahiti Iti to take in the breathtaking scenery of waterfalls, clear waters, caves and archeological sites. A Tahiti cruise can offer you more than you may expect. Experience floating with turtles above unspoilt tropical reefs brimming with fish in every colour imaginable. Or venture into the impressive mountains to enjoy stunning views over the azure ocean waters, stretching as far as the eye can see. You can also enjoy water sports and museum visits, as well as sampling the mouthwatering cuisine at one of the many restaurants in Tahiti Nui. Cruise lines currently offering trips to Tahiti include Paul Gauguin Cruises, P&O Cruises, Royal Caribbean and Celebrity Cruises. Many of the Tahiti cruise trips also offer you the opportunity to visit other fantastic locations such as Hawaii, Chile and Auckland.